National League leaders Cheltenham made it five successive wins with victory at Tranmere Rovers. The victory also enabled them to set a new club record of 21 games unbeaten. Danny Wright hit the winner, his eighth goal in six games, after just three minutes, when he smashed home Asa Hall's cross. Tranmere were the last team to beat Cheltenham in the league in September, but they could not repeat that as their own five-match unbeaten run ended. 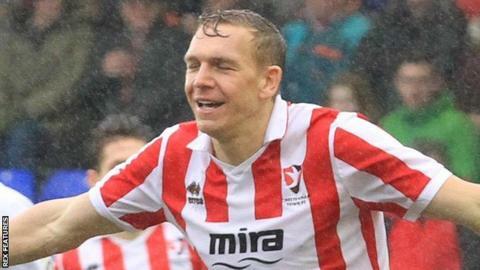 Cheltenham remain four points clear of Forest Green, with Tranmere in fourth place. "It was a great win but a historic win as well, so I'm pleased for this group of lads that we've all got our names in the record books. "You can't just pick up these points, you've got to go and earn them and we had to earn it today. "I thought we were magnificent in the first half and maybe should've had one or two more. "Our defending's been very strong and one-nil is a one-nil - I'd have liked it to be two-nil, but it's great for our supporters to see another win from their team and no goals against." Match ends, Tranmere Rovers 0, Cheltenham Town 1. Second Half ends, Tranmere Rovers 0, Cheltenham Town 1. Offside, Cheltenham Town. Dan Holman tries a through ball, but Dan Holman is caught offside. Attempt missed. Michael Higdon (Tranmere Rovers) right footed shot from the right side of the box misses to the right. Assisted by Lee Vaughan with a cross. Attempt saved. Lois Maynard (Tranmere Rovers) header from the centre of the box is saved. Assisted by Adam Mekki. Attempt missed. Adam Mekki (Tranmere Rovers) right footed shot from outside the box misses to the right. Assisted by James Norwood with a cross. Attempt saved. James Norwood (Tranmere Rovers) header from the centre of the box is saved. Assisted by Adam Mekki. Attempt saved. Jake Kirby (Tranmere Rovers) right footed shot from the right side of the box is saved. Substitution, Cheltenham Town. Jack Munns replaces Jack Barthram because of an injury. Substitution, Tranmere Rovers. Jake Kirby replaces Jeff Hughes. Attempt missed. Asa Hall (Cheltenham Town) left footed shot from outside the box misses to the right. Substitution, Cheltenham Town. Jordan Cranston replaces James Dayton. Substitution, Tranmere Rovers. Adam Mekki replaces Gary Taylor-Fletcher. Attempt saved. Daniel Wright (Cheltenham Town) left footed shot from the left side of the box is saved. James Dayton (Cheltenham Town) wins a free kick. Attempt missed. Daniel Wright (Cheltenham Town) right footed shot from outside the box is too high.